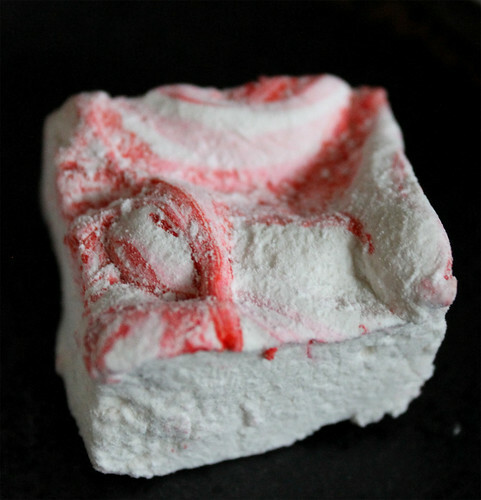 Homemade marshmallows are squishier and have a luxuriously creamy texture to them, unlike the airy ones from the store. Last Christmas, I made a classic vanilla marshmallow and dipped them in chocolate. 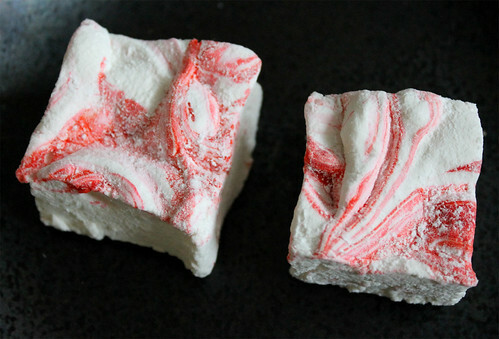 This year, I opted for peppermint marshmallows instead and swirled some red food coloring on top to give them that peppermint candy look. 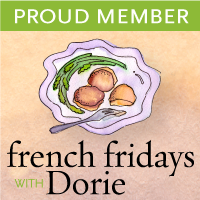 These keep for about three weeks in an airtight container, allowing you to keep them on hand as a quick hostess gift or to offer to unexpected drop-in guests (if they manage to stick around for that long that is!). The peppermint makes these sweet confections surprisingly refreshing, and would be amazing in a cup of hot cocoa or add a nice twist to your traditional s’mores. Place the gelatin into the bowl of a stand mixer along with 1/2 cup of the water and allow to bloom for at least 10 minutes. Have the whisk attachment standing by. In a small saucepan combine the remaining 1/2 cup water, granulated sugar, corn syrup and salt. Place over medium high heat, cover and allow to cook for 3 to 4 minutes. Uncover, clip a candy thermometer onto the side of the pan and continue to cook until the mixture reaches 240°F, approximately 15 minutes. Once the mixture reaches this temperature, immediately remove from the heat. Turn the mixer on low speed and, while running, slowly pour the sugar syrup down the side of the bowl into the gelatin mixture. Once you have added all of the syrup, increase the speed to high. Continue to whip until the mixture becomes very thick and is lukewarm, about 10 minutes. Add the peppermint extract during the last minute of whipping. While the mixture is whipping prepare the pan. Combine the confectioners' sugar and cornstarch in a small bowl. Lightly spray a 13-by-9-inch metal baking pan with nonstick cooking spray. Add the sugar and cornstarch mixture and move around to completely coat the bottom and sides of the pan. Return the remaining mixture to the bowl for later use. When ready, pour the mixture into the prepared pan, using a lightly oiled spatula for spreading evenly into the pan. Drop red food coloring onto marshmallows and use a toothpick to swirl the food coloring into the marshmallows. Dust the top with enough of the remaining sugar and cornstarch mixture to lightly cover. Reserve the rest for later. Allow the marshmallows to sit uncovered for at least 4 hours and up to 12 hours. Turn the marshmallows out onto a cutting board and cut into 1-inch squares using a sharp knife or pizza wheel dusted with the confectioners' sugar mixture. Once cut, lightly dust all sides of each marshmallow with the remaining mixture, using additional if necessary. Store in an airtight container for up to 3 weeks. Mardi @eatlivetravelwrite December 6, 2012 at 6:50 p.m. I am very jealous of your beautiful marshmallows - I can't seem to make them!! But your recipe has inspired me to give it another go! Bonita December 9, 2012 at 12:32 a.m. Thanks Mardi! Give these ones a try; the base recipe works like a charm.